This is continually updated as bookings get confirmed, so please check back or contact us if you want to book us on a specific date that's already booked. We're very happy to be supporting Lifecare with a fund-raising ceilidh! Find out more about the event and charity here and buy your tickets here. Running workshops and a ceilidh as part of our cultural exchange programme with the New Scots Community as part of British Science Week. Running workshops with schools on the theme of space and music with An Lanntair. Edinburgh Multilingual Stories Festival EMSF is bringing together artists, researchers, children and communities for the first time in Scotland to celebrate the diversity of our city at Assembly Roxy. Organised by Bilingualism Matters, Theatre Sans Accents and the Polish Cultural Festival Association, this unique event is a chance to represent and empower the different voices from here and beyond gathered in Edinburgh. The festival will offer an opportunity for bilinguals to creatively explore and express what it means to learn and speak more than one language, and for monolinguals to get a glimpse of the bilingual experience. Our programme includes a multilingual ceilidh with Science Ceilidh Band, and a series of FREE workshops, talks, performances, concerts as well as scratch nights showcasing the best of our local talents across music, dance, theatre and visual arts. Are you ready to Strip the Electron? Or try the Planetary Festival Dance? Join the award-winning Science Ceilidh band along with researchers from the School of Physics at the University of Edinburgh. On Saturday evening, we’re going to get down and physical with a full-blown proper ceilidh for the big kids with a mix of traditional and physics-themed dances touching on space, electrons & everything in-between! No partner, science or dance experience required! On Sunday daytime, families will get hands-on with our DIY Science Orchestra workshops all about the science of music. Experimenting with a series of unlikely instruments from fiddles to pipes, including making your very own kazoos to take away, we’ll learn all about physics of sound before we make some music together as a DIY science orchestra! Finally, the end the busy day, there'll be a family-friendly science ceilidh to put your physics learning (and dance moves) in action!! Ever wondered about how learning gaelic and other languages may benefit your brain? And how creativity and music supports wellbeing? Join neuroscience educator and fiddler Lewis Hou from the Science Ceilidh (Hands Up For Trad Community Music Organisation of the Year 2018) on his visit to the Isle of Lewis introducing the brain and some of research around bilingualism, creativity and wellbeing. Everyone is welcome to join for a blether over a cup of tea, a tune and a song or two - bring your questions! Join us for a free community ceilidh celebrating the diverse cultures and research of the people living in Scotland. In collaboration with the New Scots community, The Welcoming Edinburgh and the award-winning Science Ceilidh Band as part of EU Researchers Night Explorathon - Researchers' Night Scotland. All are welcome, absolutely no dance or research experience required - everything will be called! Featuring traditional Scottish dances, a few with a twist of science (Ready to Strip-the-Helix anyone?) and short talks from researchers. If you'd like to be involved and share a story, dance, song, research or anything else, please get in touch! Go Biggar or go home! Ready to Strip the Helix? Or try the Canadian Brain Dance? Join us at Biggar Science Festival for an evening of your favourite ceilidh dances with a twist of science with the award-winning Science Ceilidh band, voted Community Music Organisation of the Year 2018. All welcome, no dance or science experience needed! Come join us for a day exploring the brain at William Patrick Library on the Brainworks Day! With free drop-in activities, talks and some science-themed dancing with the award-winning Science Ceilidh, everyone is welcome to join in. Reserve your tickets here or on the facebook. Come join our Science Ceilidh at the Stove Network in Dumfries on the evening of the Friday 20th April. We'll then be part of the Mayhem day suitable for all the family on Saturday 21st April. Come and dance the night away at this unique event! This is a free ceildidh, but with a twist: some of the dances will have been designed by physicists, to illustrate their research or physics concepts they love. With the Science Ceilidh Band playing live, it promises to be a fun evening! This is open to absolutely everybody, from ceilidh lovers to mad physicists, wethere you are affiliated to the University or not. 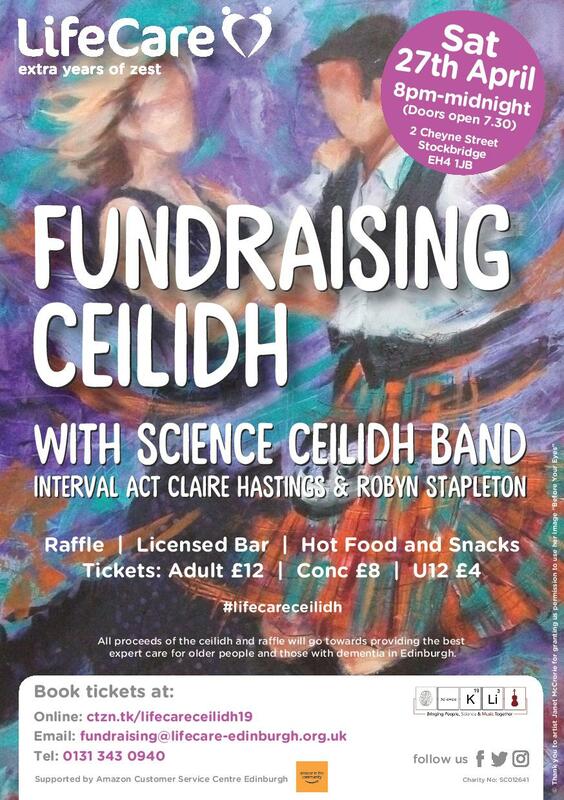 Book your ticket onhttps://www.eventbrite.co.uk/e/physics-ceilidh-tickets-42862493873. IF YOU ARE AFFILIATED TO THE UNIVERISTY OF EDINBURGH, PLEASE REGISTER ON http://www.festivalofcreativelearning.ed.ac.uk/event/soft-matter-physics-meets-ceilidh-dancing. We thank the The Festival of Creative Learning at The University of Edinburgh for generous support.